Do all new bloggers go through this? I get so distracted now browsing other blogs that it seems I forget to write my own. And then there is all the reading I do. If you want to see my reviews check out my shelves on GoodReads. Today I started on my second read of the last two books of A Song of Ice and Fire. In this second reading I am following the prescribed list according to Boiled Leather.com. Maybe it is because of watching the series and talking with my offspring about both books and HBO version (my adult children roped me into it and we have had many, many discussions, and listened to podcasts (Boiled Leather.com once again), or maybe it is that reading the two books in this manner, it all makes more sense this time around. I know more of the characters and the roles they play. Umm. Did I mention I have ADD? And that I am now 63, my mind jumps around more than it ever did before. So… The blogging, yes. How do you all come up with such great topics to blog about? How is it that you tear yourselves away from reading to write, blogs or otherwise? I am still trying to figure out that balance. And I’m retired. How do you students, young parents with jobs do it all? And now I need to get ready for my walk. The weather was hot today so my hubby and I decided to walk in the evening when it is cooler. Don’t have to wear sunscreen this way! 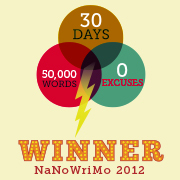 NaNoWriMo have helped me R-TUTE. Now I have 10 novels and need to learn to edit properly to have something worth sharing. Still the journey of writing has had its own rewards. 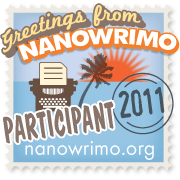 Love this author’s blogs! I confess, I was once guilty of this behavior, too. I would absolutely edit my WIPs to DEATH, and this behavior made it impossible to finish. Thankfully, blogging and writing non-fiction has helped tremendously with my fiction. I have learned to overcome perfectionism and ship. 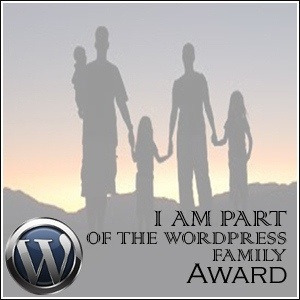 I Won a Leibster Award! A little over a week ago, I was excited to be nominated for the Leibster Award. By Linda G Hill . Thank you, VERY much! Then I saw the list below for what is required. Yikes! And what is a Leibster Award anyway? I’ve sat on this for a week and finally decided to do a Google search. The first entry is a blog by Sopphey who was kind enough to share her research into the topic. There you can find the history of the Leibster Award and a bit about why it is there. List 11 random facts about you. The following are MY randomnesses. What are YOURS? 1. I am addicted to Game of Thrones, I’m on my second read through and can’t even count how many times I have watched the series. 2. I love to sing and play the piano but haven’t been able to since we moved in these apartments. 3. I love to read/review fantasy/sci-fi books that are written by woman with strong fem main characters. Obviously I slip every now and then (see #1) You can find my reviews on GoodReads, Amazon, LiveJournal, Smashwords and various other places I am still learning about, i.e. Libboo, etc. 4. I love to play with Tarot Cards and read astrology books. 5. I am VERY ADD! 6. Plarn is one of my favorite fiber to crochet with. I feel I am saving the planet while I make soap dishes, scrubbies, planters, pencil/pen holding bookmarks, can cozies, water-bottle carriers, hats and other items of used plastic bags. I do crochet with yarn but haven’t the coin to buy it. Plarning saved me this last Christmas when I had no money to buy gifts for loved ones. Okay, the plarny items were all that special, but I think my loved ones knew I loved them. And I had fun in creating these gifts. 7. I collect dragons. I love dragons. They appear often in my own novels. 8. I recently was diagnosed with diabetes. So I am on mission. I have gone vegan and gluten-free, will trying to be GMO free, and organic as much as possible. Oh, and I love coconut oil! 9. I am learning about GeoCaching seems like my friends are having fun with it. 10. My husband is retired, I’m on disability, so we go to bed hopefully by 4AM and hopefully wake by lunchtime. Answer the questions that were asked of you. 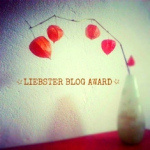 Nominate 11 other blogs for the Liebster Blog Award and link to their blogs. 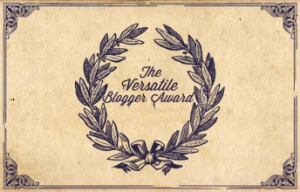 Notify the bloggers of their award. Ask the award winners 11 questions to answer once they accept the award. The following are the questions with my answers. What would YOUR answers be? 1. If you could live anywhere in the world, where would it be? Near or on the ocean. I love the beach in any weather. 2. How many pairs of shoes do you own? I am not a typical fem. There was a time I ogled over shoes. Now I wish for comfort. Mostly I love to go barefoot when I can. That said: three pair of tennis shoes, multiple (10?) pairs of flip-flops, one pair of “dress” shoes. I lived most of my life in Southern California. I miss the variety I was able to be a part of there. If I were, would I have picked this beautiful black cat that is sleeping next to me out of the scores of cats in the pound? 5. What’s your favourite fruit? It used to be apples, in summer it is watermelon. Right now I am in love with the grapes. 6. If you could collect anything, what would it be? Anything at all. 7. Name the members of what would make up the ultimate band, dead or alive. 8. What song can you not help tapping your foot to? Game of Thrones, keeps me awake at night! 9. If you could paint the walls of your living room in any colour, what would it be? My living room used to be a bright yellow. I loved it, helped me wake up in the morning. 10. Are you or have you ever been addicted to a game? 11. Are butterflies pretty or creepy? Beautiful unless they decide to walk on me when I don’t see them first. List 11 random facts about you. I can’t believe I made it home just in time to catch the end of asparagus season! 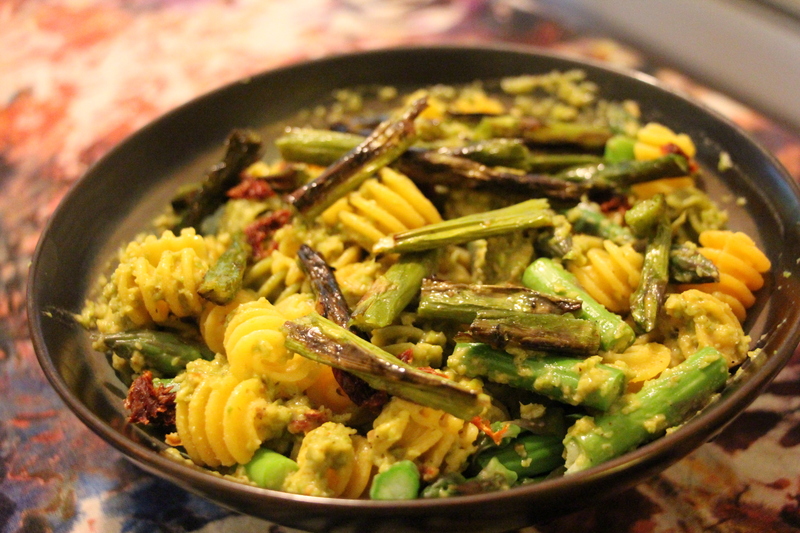 Inspired by Laura, co-owner of Riverbank Farm, my housemates and I decided to try making some asparagus pasta. Who knew that it would be so amazingly tasty? Freshly blanched asparagus pasta immersed in creamy asparagus sauce, and topped with broiled asparagus. wow. This is definitely my new favorite meal! Too bad I will have to wait another year for more asparagus. If you have some left, I highly recommend making this tasty dish while you can. 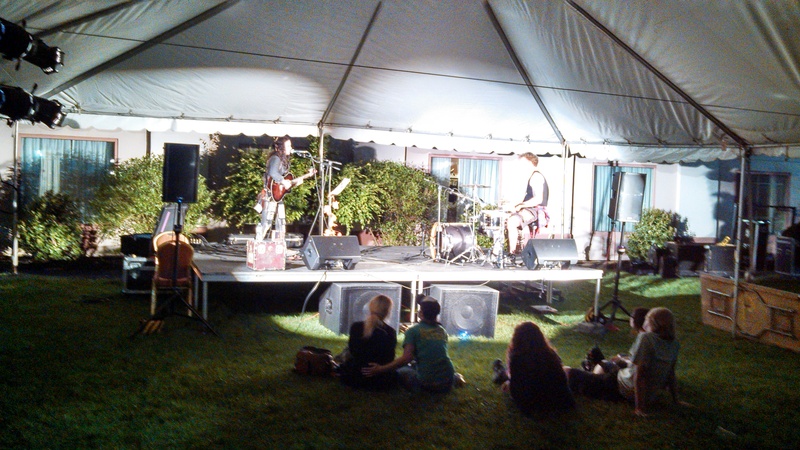 Here are some of the music and events from last weekend’s Steampunk World’s Fair. If you are around NJ in Mid-May next year you should try to make this event. It is so much fun. Come in costume or in regular cloths. Everyone is welcome. I had no idea how popular they were. They filled a massive tent and overflowed into the parking lot around the stage. Much fan girl screaming was had. My family fell in love with this band and stalked them throughout the event. Not creepy stalking… just making sure to hit their performances. Part two of the fun my friend had! 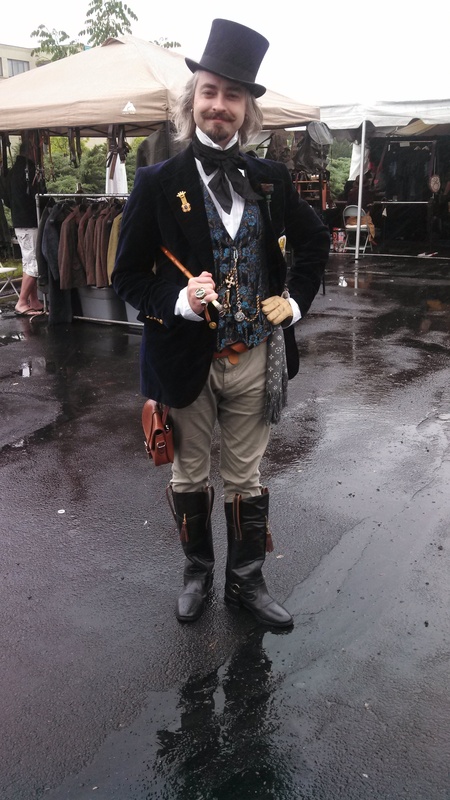 The beautiful people were everywhere at Steampunk World’s Fair 2013. Everyone was so sweet when we accosted them asking for photos. No one turned us down and everyone posed and smiled on queue. It was fabulous. 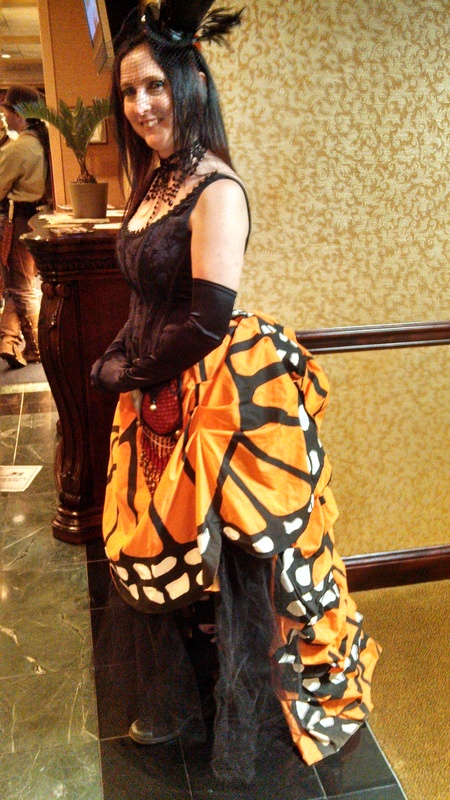 I chased this lady down the hallway to get her photo crying “Monarch Lady! Monarch Lady!” It was worth it. A friendly Jedi helped catch her attention for me. The friendly Jedi. He really was a trip. 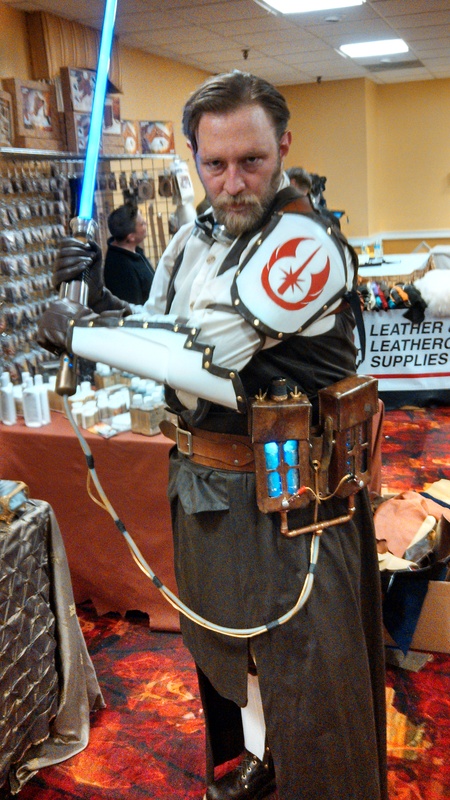 His light saber had a power pack that lit up attached to his belt that looks so snazzy. Even though it was drizzling outside this gentleman posed for us to snap his pic. I fell in love with his hair. Can’t explain it. All I know is he looked particularly dapper. What fun my friend had! Am breaking this up into a few posts because there was just so much to see and do. Steampunk World’s Fair (SPWF) 2013 is officially over. I’m back home on the west coast and beginning to return to normalcy. I was dressed in red as the Fairy Catcher Extraordinaire on Friday. 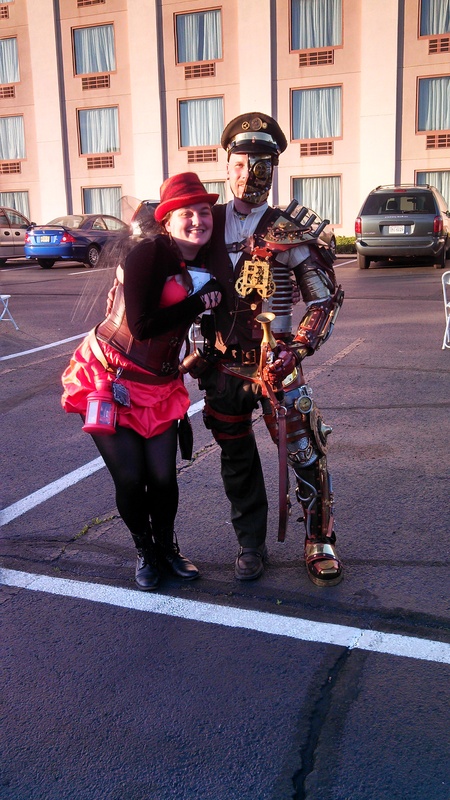 Then I saw Steampunk C3PO, accosted him, asked for a hug, and made Juana take a photo. One of my fav moments of the night. Next day I was the Raven Lady. Lots of black and feathers, although I don’t think you can see the feathers too well in the photos. My bustle was made entirely of them, and the faux iron wings were lined with feathers on the top. To pseud or not to pseud. These have been my thoughts all along. I can’t decide on a Psued but feel I need one for my deeper darker writings. What are your thoughts?